by Jacob Sullivan My first exposure to the music of the Italian progressive band, Goblin, was, like many, by way of George Romero’s 1978 classic Dawn of the Dead. While Romero only used part of Goblin’s score composed for the film, the parts used were beyond memorable. As it came blaring in at the first sight of the Monroeville mall, the theme entitled “L’alba dei morti viventi,” filled my young tween mind full of dread. With a bass plodding slowly (much like the zombies in the film), moaning synths and an overall apocalyptic sound, the song epitomized the walking dead perfectly. And I am not alone in making this statement, as Goblin’s score would be used by plenty of cheap Italian rip-offs of the Romero classic. Goblin is much more than the band that scored Dawn of the Dead. 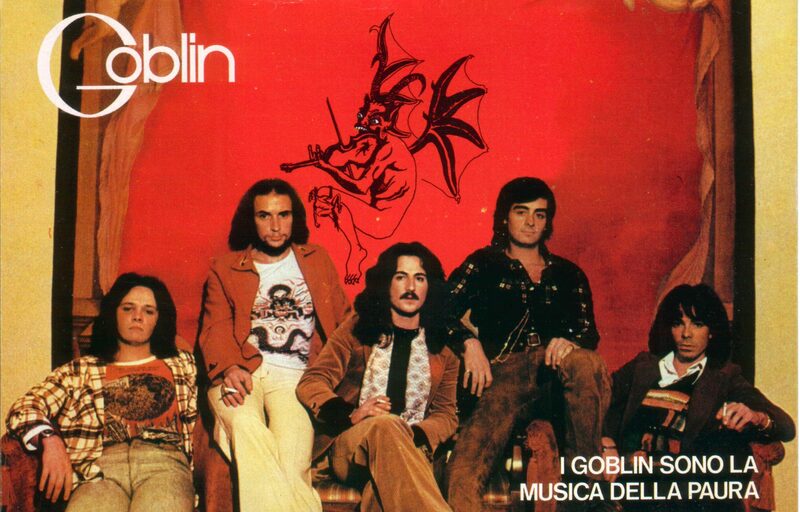 Within their short career plagued by constant band breakups and reunions, Goblin has become one of the most important names in Italian horror music, gaining a much earned cult following and still touring today, playing songs from their multiple film scores. Despite once writing a soundtrack for a romantic comedy, the group has primarily written for the horror genre, becoming a common and essential part of legendary giallo director Dario Argento’s work. It is hard to imagine Argento’s classics without Goblin’s experimental and varied scores. Starting as an all but forgotten prog band called “Cherry Five,” its first and only record flopped. While a commercial failure, it caught the attention of Italian auteur Dario Argento, who believed the band could fix the score for his new ambitious giallo, Deep Red, or as it is known in Italy, Profondo Rosso. Argento thought the dark murder mystery didn’t correspond with original composer Giorgio Gaslini’s more jazzy score. Reimagining Gaslini’s original work, Cherry Five—which changed its name to Goblin to fit with the macabre career move—had two days to compose and record a new soundtrack. Within that time, not only did Goblin create one of its best works, but the band also kickstarted one of the great collaborations in horror. The score of Deep Red is notable for a number of reasons. Covering a variety of genres and styles, Goblin utilizes creepy organs, funk guitars, blues and jazz influences, and prog rock leanings to craft its distinctive style. It was a blend of genres that was unique and original, eventually going on to influence electronic, metal and experimental music. Appearing throughout the film, the score accompanies and accentuates Argento’s beautiful visuals and gory killings. The piece “School at Night” is a standout, becoming a common motif. With its unsettling children’s choir and toy piano, it sends shivers down the viewer’s spine and warns of oncoming violence. Their score fits perfectly within the context of the film, but Goblin’s debut also works as a standalone piece of music. Argento and Goblin would follow up Deep Red with what many consider to be the collaboration’s most impressive output. Suspiria, a film about an American ballet dancer attending a German dance academy where murders begin to occur, is the best introduction one can have to Goblin and Argento. Low on plot and dialogue, Suspiria is a sensual cinematic experience. The entire film relies on beautiful colors, dazzlingly crafted and framed images, and most important to this piece, terrifying music. Goblin’s most experimental work, the mixture of pagan chants, clattering rhythms and gothic instrumentation creates a wholly unique and terrifying experience. It’s Goblin’s scariest work, but Suspiria also signifies the strongest marriage between a film’s visuals and their music. Incredibly, the score was made before Suspiria was filmed, and Argento’s shots—which are already spectacular without the music—gain meaning and definition. As the audience hears the theme or the song “The Witch” creep in, it becomes apparent that something awful will soon happen. Suspiria would mark Goblin at its peak, but the band continued to score horror films with varied results, witnessing multiple breakups, member changes, and reunions. While Goblin would craft strong scores for Dawn of the Dead and the rather bad Italian Alien knock-off, Contamination, the group would also produce far more mediocre works for shlock like the Australian horror film Patrick and the Joe D’Amato gross out fest, Buio Omega. While these are entertaining films for horror and exploitation fans, Goblin’s soundtracks hardly do anything to compliment or elevate the experience of watching them. Following this mediocre period, Goblin would reunite for another collaboration with Argento on his 1982 giallo, Tenebre. The film concerns a novelist who writes murder novels getting stalked by a copycat killer, and the project would mark another solid piece of work for the band. Filled with gothic keyboards and heavy drumming, Goblin doesn’t experiment much, but nonetheless, the band creates an interesting score for one of Argento’s less interesting features. Goblin would reunite once more for a less-than-noteworthy entry in the careers of both Goblin and Argento. But even with a less than stellar ending to the journey, the band has created a lasting legacy. They may not be the most prolific or widely-known composers, but Goblin’s influence on horror is indisputable. Aside from defining the work of Dario Argento, their music and career has made a meaningful impact on the likes of Fabio Frizzi and Trent Reznor, as well as filmmakers like John Carpenter, Ti West, Edgar Wright, and Quentin Tarantino.